I've been having some internet troubles the past few days, but they seem to have been resolved. Here's hoping! On Sunday my mum and I went to the Adelaide Way We Wear Winter Fair at the Burnside Ballroom – they’re held all over Australia, at different times of the year. This was the second time I’ve attended one of the fairs – the first time was the Autumn fair and I came away with this dress. This time, there were lots of vintage goodies to be ogled, including a ridiculous number of divine dresses none of which, alas, were within my price range. I didn’t come away empty handed, however. This was actually bought for me (as a Xmas present, so I’m not seeing it again until December) by my mum – it’s a little baby doll and bloomers set – I’d say from the 1960s - in its original box. 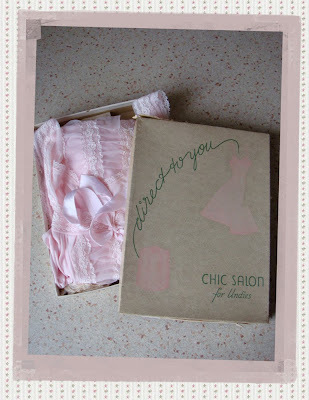 I’m not actually going to wear these stockings but I thought the box was pretty and would make a nice decorative piece. 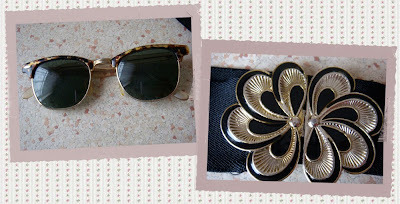 Another pair of sunglasses to add my collection! And, finally, another cinch belt. How darling is this little hat brooch? It even has a feather in it. And these screw-on earrings are just so pretty. I can't wait to wear them. 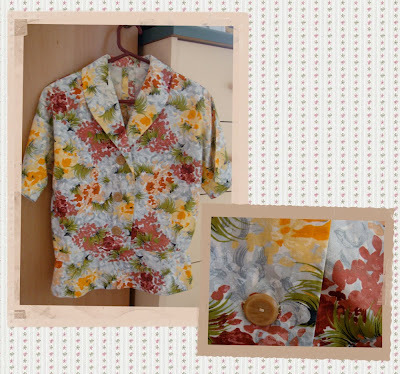 I bought this 1950s blouse from the stall the singer and bass player of The Satellites - an amazing Adelaide rockabilly band - had. I have to admit, I was a little ‘starstruck’ and couldn’t bare to stay by their stall for very long, the first time we went past – I really wanted to tell them how much I love their band but I was lost for words! I went by a second time, after we’d been around the whole fair, because I wasn’t entirely satisfied with my purchases – sure, I knew I’d found some great things but I still felt there was something missing. And, boy, am I glad I went back – this little blouse is too perfect. When I saw it, my heart skipped a beat and I knew we were meant to be together! I was more than delighted when I tried it on and it fit me like it was made just for me. Just as I knew the blouse and I were meant to be, I knew this hat and I were destined for each other. I debated for a few minutes whether or not I should leave it and come back to it but I knew I wouldn’t be able to walk away from it – how could I? It’s divine! There's something pirate-esque about it, I think. As I mentioned, I've had internet problems so I've actually got a few other things to blog about over the next couple of days. You made so many great finds. That's so amazing that you found the baby doll and bloomers in their original box, that's so cool. And love the sunglasses, I've been trying to find a pair like that for a while! the shape reminds me slightly of a sparrow, or some kind of bird. oh you got some fun things!! That baby doll and bloomer set looks gorgeous! And what a lucky thing for it to still have it's original box! PS- the stained glass dress looks fantastic as well! I bet you Australia and Canada have a pretty similar vintage scene. Neither of us had gigantic populations in the 50's so our selections are smaller than other places (and therefore more expensive)! On an unrelated note, I finally looked at your flickr account and saw the Roswell photos you posted (of the tv show) and I love that show! Also I saw that you are vegan? Is that correct? If it is: that's awesome! My girlfriend is vegan and I'm considering it so I just wanted to say kudos to you! 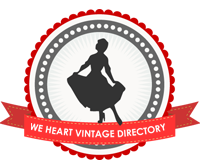 Dusky Ledoux: Thanks =] I've only just started getting into vintage lingerie, myself. Lizzy: I know - I was so pleased =D I hope you find some glasses like those. =] Thanks. Caitlin: Thank-you. Oh, I can see that! Oh, that's an interesting point - I never thought of it that way. I'm glad you love Roswell too. It's always nice to find a fellow fan. I'm a strict vegetarian but don't wear leather or fur or anything. I've thought about going vegan, though. What great finds! Can't wait to see them on! Such amazing finds! I think the hat pin and "real" hat are my very favourite pieces, but they're all superb! You're so fortunate to have fairs like this in your area! I came away with 2 hats (1 which I wore on Tuesday!) and 3 pairs of gloves (2 to match the hats :P). Did you buy the blouse from the stall upstairs to the left (facing the stage) that was manned by the blonde lady with the rolls and the man with the awesome 50's hair? Because the lady next to them (in the front corner) had 2 hats that I really liked but wasn't 100% sure about, and now I would really LOVE to get them. But I don't know who she was, so I don't know who wo call about it. I'd love to buy them now! Darn! Anywho, you got some gorgeous items! Very good haul! Jessica: Thanks so much. I sure am lucky! Abi: The reason you missed me is because I was there on Saturday not Sunday! Haha. Silly me. Thanks! I'd love to see pictures of what you got, too.